This is an option of intermediate length that visits the snow-capped mountains and colorful lakes of both the Cordillera Huahuash and the Cordillera Raura. You will also visit beautiful and less-traveled places like Lake Surasaca in the Cordillera Raura. The route ends in the town of Churín which is famous for its remarkable hot springs, which you may enjoy before carrying on to Lima. Day 2: Llámac - Jahuacocha 4070m. Day 4: Cuartelwain - Qaqanan pass 4750m - Mitucocha 4230m. 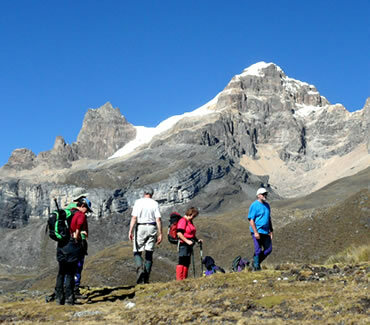 Day 5: Mitucocha - Carhuac pass 4600m - Carhuacocha 4138m. 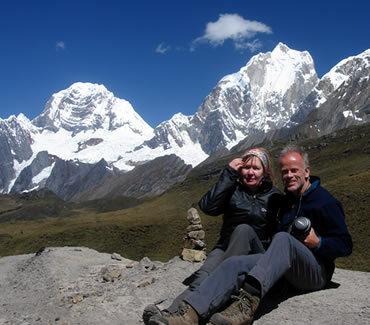 Day 6: Carhuacocha - Carnicero pass 4630m - Huayhuash 4330m. Day 7: Huayhuash - Portachuelo pass 4750m - Viconga 4407m. Day 8: Viconga – Surasaca 4380m. Day 9: Surasaca - Churín – Lima. • Depending on the time available it is possible to take a rest day at beautiful Lake Carhuacocha. • This route can also be done in reverse in which case you begin in Churín/Surasaca and finish in Llámac. • Bring a water bottle with you, in summer season it gets very hot.